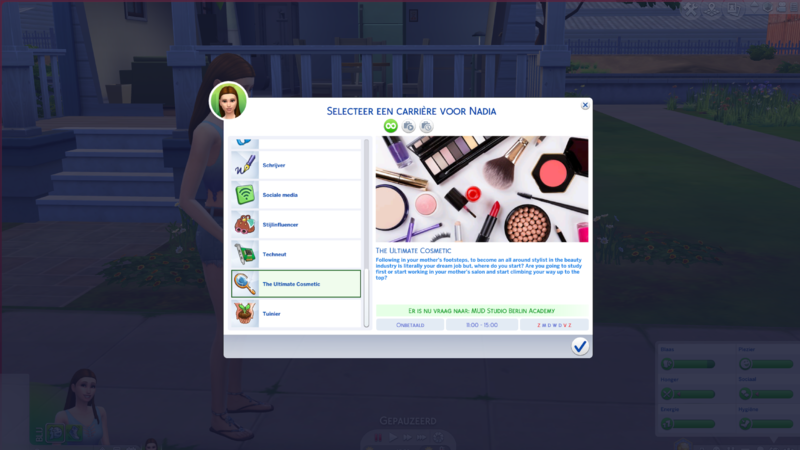 Following in your mother’s footsteps, to become an all around stylist in the beauty industry is literally your dream job but, where do you start? Are you going to study first or start working in your mother’s salon and start climbing your way up to the top? From researching, writing application letters to working a few shifts in your mother’s salon, you still are in the same place: not knowing where to begin. In the meantime, your mother has asked around. Her best friend is the owner of MUD Studio Berlin and they are always looking for new talent. It is time to bag your bags and fly to Berlin. Berlin, might have been the best option your mother ever suggested. For the past three months you learned so much, met new friends and can not wait to finish your training with an internship at MAC Cosmetics Berlin before choosing your ultimate path. You chose to stay in Berlin to follow a four month training to become a Make-Up Artist. Besides school and loads of homework, you also work part time at MAC Cosmetics to not only learn more from you fellow co workers but, also to earn a little bit of cash so you can start your own blog and maybe in the nearby future start your own youtube channel. A few months in, you finished school and you are about to quit working at MAC Cosmetics because your blog is really popping off, so MAC Cosmetics reached out to you to help them out with their new Make-Up collection which will launch at the end of this year in Cologne. They invited you to come and hang out with the biggest influencers, not only to network for your own sake but, also swatch their products live and give a honest review of their products. MAC Cosmetics were blown away by your presentation on the launch party that they decided to hire you to not only promote their products on your blog but, also make professional photos of their products for their website. 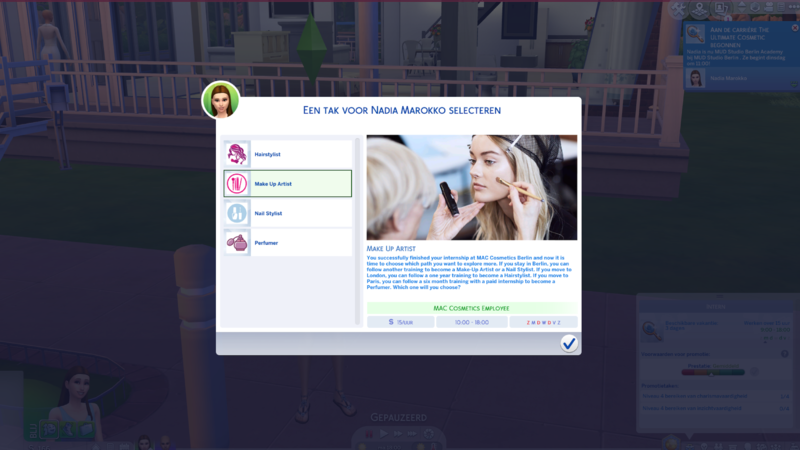 A bunch of photos and articles later, your boss decided it might be time to start you on writing blogs for the company and maybe help them out on a few small events as a Make-Up Artist. For now you will only attend events in Berlin and write articles from the safety of your home. Keep working hard and their might be more big opportunities coming your way. At the last moment, your co-worker invited you to tag along and watch a runway from a small designer in Cologne. When you land, all you really expected was to sit and watch the show but, the designer itself came up to you, tears running down her cheeks, begging you to help them out because their Make-Up Artist didn’t show up. You decided not to ask and agreed to help them out. The show is a success and the whole team is really grateful for your help. Back in Berlin, you get called to the office. Your boss isn’t actually happy about what you did but, she also understands why you did what you did. She hands you a letter, which she received shortly after the show in Cologne. You want to scream, jump or better hug your boss, which you didn’t do. You got invited to work for Toni&Guy at Fashion Week in Paris this fall. How exciting is this? After an incredible year of working for different brands throughout the Fashion Week season and traveling to the most beautiful capitals, Paris, London, Milan and New York. You decide it is time to take a few steps back and enjoy some less hectic and stressful situations. You get hired for different tv shows and movies to provide the celebrities from a glow. It is something else but, it is also really fun and you get to meet a lot of famous celebrities. Who knew that you would become so successful in the beauty industry? No one, right? Your mother always believed in you, she truly did. Once you returned home, she gives you the keys of her salon and knows that no matter what, you will look after her salon like it has always been yours. You chose to stay in Berlin to follow a four month training to become a Nail Stylist. Besides school and loads of homework, you also work part time at Nails For You. Your daily job consist out of doing customers nails, restock products and advise customers how to take care of their nails. A few months in, you successfully finished your four month training. Since you are eager to learn about nails and how to take care of them, your boss decided it might be time to invite you along for a few professional classes teached by the best Nail Stylist from Berlin. You and your co-workers learn how to spot different frailty on your client nails. She also shows you the benefit of giving a small hand massage using natural hand products. A few weeks later, you have earned enough money and knowledge to start your own Nail Salon. You can’t really afford to rent a place yet but, you decided to start from home first: finally that empty room will put up to good use now. You advertise mainly through Social Media and very soon your very own website will launch: where clients could book their appointments and view pictures of your work. Recently, a customer asked you to do her nails for her wedding day. You didn’t really know what to say, you were excited of course but, setting nails for a wedding day is something you never done before. You couldn’t really say no, so every night until the wedding you researched every night looking for inspiration. On the day itself, you were very nervous but, the bride loved her nails and can’t believe that she never asked you to do her nails before. Now, you are fully booked for the next few months. Sarah Linow, a very well known wedding planner from Berlin reached out to you after one of her clients saw her amazing nails. She not only wants to work with you but also wants you to meet her photographer and learn a few simple tricks. 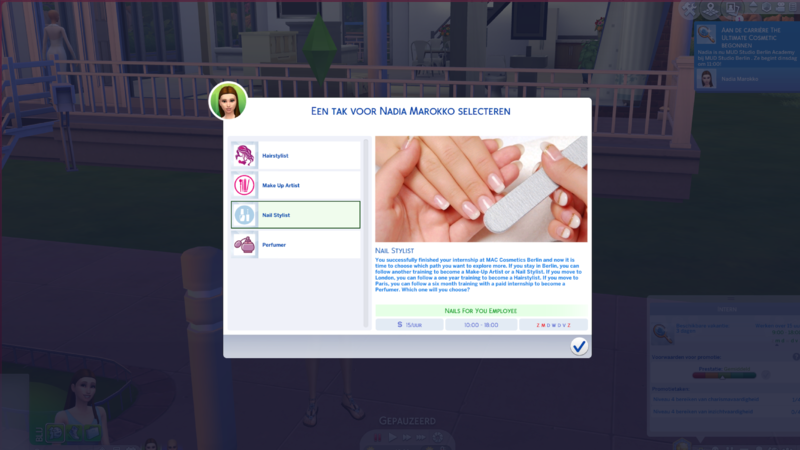 Now, you can’t stop taking beautiful photos of your client nails. You didn’t know that working together with Sarah Linow would be a great move for your career. Your face is even in the newspapers! Giving big brands, which have huge fan bases a change to reach out to you. The Nail Box, is one of those brands. They want to collaborate with you and bring out two new boxes: one filled with your favorite boxes and one filled with your own nail products. How exciting! 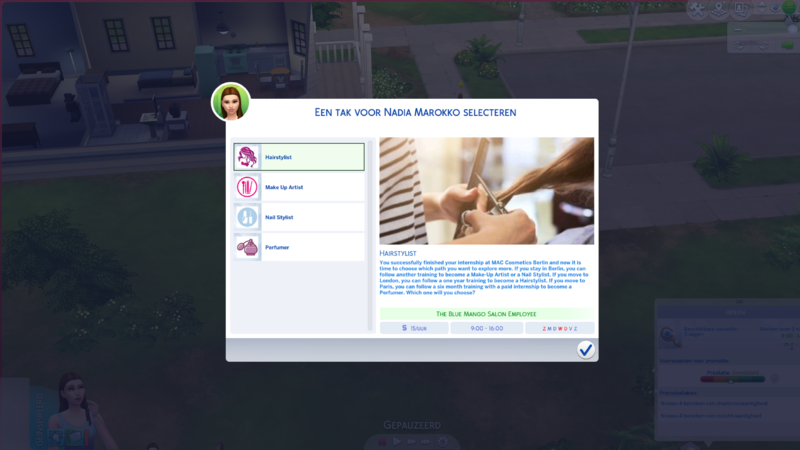 One of your dearest friends, you guys met at the start of your internship, also owns her own salon received some bad news and has to leave immediatly to take care of some privat stuff. She doesn’t want to close her salon so asked you to look after it. You promised her to take really good care of her salon and that you won’t let her down. Who knew that you would become so successful in the beauty industry? No one, right? Your mother always believed in you, she truly did. Once you returned home, after a hectic year of running your best friends salon: she gives you the keys of her salon and knows that no matter what, you will look after her salon like it has always been yours. You chose to move to Paris to follow a six month training and paid internship to become a Perfumer. You follow your paid internship at Joyvoy Paris, the most luxury perfumery in Paris. Your daily tasks consist out of helping customers, restocking and pricing products, cleaning shelfs and helping customers at the check out. Six months later, you sucessfully finished your internship at Joyvoy Paris. On the last day of your internship, you left your resume behind but, you didn’t get a call from your boss but from one of the managers of the Caron Factory. They were really impressed by the way you could handle yourself in a stressfull situations. They want to hire you as one of their bottle cleaners, promising with a bright future at the Caron Factory. A few shifts later, the headmanager thinks it is time to give you a slighty different job. You get stationed at the packing station. Packing orders for stores and customers. All you really need to do is not make any mistakes. After a few week of packing and shipping orders, you start taking a couple of chemistry classes to give your first hand at mixing fluids together. Twice a week you will help out your co-workers mixing fluids and odors to make new fragrances for big brands. As a Advertising Assistant your job is to come up with different mood boards for each new fragrance that will launch that month or later that year. You present every moodboard to your manager and they will send it to the brand to wait for approval. As a Advertising Manager your job is to listen and judge your assistants moodboards. Direct the promotion video for the fragrance and meet daily with your team to look over the visuals. Everything needs to be neat, clean but also fresh and on trend. How do you sell the perfect perfume? Mére, is france for mom, mom is your inspiration. What better way to praise your mom and bless her heart with her own perfume? You flown her out to France to attend the exclusive launch party. Tears are streaming down her cheeks as soon as she takes a small sniff from your own created fragrance. That’s all you wanted, to make her proud. You chose to move to London to follow a one year training to become a Hairstylist. Besides loads of homework, you find time to work at your local hair salon, The Blue Mango. Your work consist most out of cleaning, helping at the check out and serving tea and biscuits to your customers. A year later, you succesfully finished school and work full time at The Blue Mango Salon. You know the basics but, you are thrilled to learn more, so together with a few co-workers you follow a Hair Cut & Blow drying course. You learn how to cut hair in different styles and the best way to blow dry different types of hair. To keep on trend with the latest hairstyles, your boss thinks it is a good idea to send you yet again to another hairstyling course. This time you will learn how to curl different types of hair and how to braid various of hairstyles. After a few weeks of working a few shifts at the The Blue Mango Salon, you signed up to follow a four month special Hair Care and Coloring course at your old school. You will learn the basics of hair coloring, how to mix the right liquids and how to apply the right hair masks. L’Oréal has reached out to you to follow a specific hairstyling course at their office in central London. You feel honored and can’t wait to learn from the best in your field. The course lasts a whole week, you will visit the L’Oreal factory, office and hair salon. At the end of your week, you will receive a goodie bag filled with their products. Once home, you open the goodie bag to see all the new products from their new collection piled up on your dining table. Your eyes travel to the white letter, you pick it up to read it through. You got selected to test out a whole year worth of L’Oreal products before it hits the shelfs. A few months later, you and L’Oreal have been working together for a pretty good time. You are actually promoten to be their Bussiness Manager. Your daily tasks consist out of bringing up new ideas, test out new formulas and write review blogs for their website. 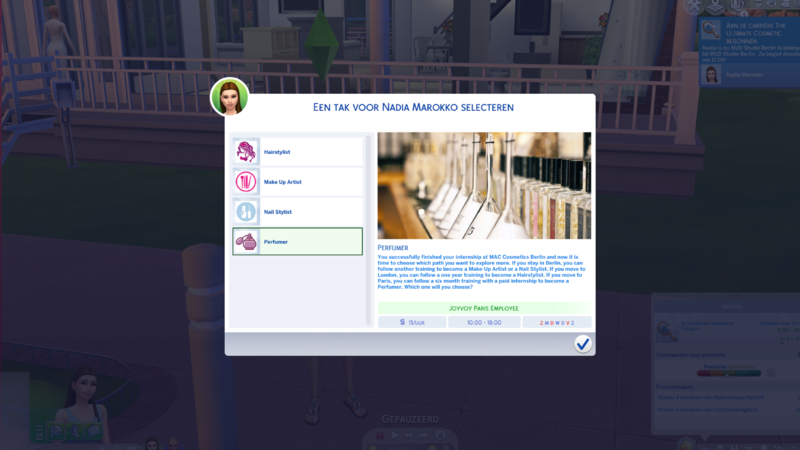 Pharmacist Career + Russian Translation Added!